Hong Kong’s biggest celebration tracks with the rest of the Sinosphere: Chinese New Year marks a new beginning for Hong Kongers, who greet the occasion with fresh hopes for business success and overall good fortune. Against the Western Gregorian Calendar, the Chinese lunar calendar that forms the basis of Chinese New Year shifts the holiday’s date annually based on the phases of the moon. In 2019, Chinese New Year falls on February 5 – the “Year of the Earth Pig” that ends in January 24 the next year. Each lunar year is dominated by one of the 12 Chinese animal signs, which in turn decides whether one’s year will be serene or stormy. Most of this depends on your own animal sign being on good terms with whichever animal sign rules the year, as well as a host of stars that decide everything from your career prospects to what color you should paint your kitchen. Just like turkey and stockings at Christmas, Chinese New Year in Hong Kong prescribes a long list of traditions and customs. Many of the traditions have a similar flavour to those during Christmas, such as visiting family and exchanging Lai See gifts, but some are unique. You'll find temples open around the clock, gifts piled up at the feet of the gods and flower markets packed from floor to ceiling with kumquat trees. The Chinese are firm believers in good and bad luck, and Chinese New Year is a veritable Russian roulette of both. Cleaning your house and using scissors invite misfortune; serving “lucky food” will bring good fortune. Following particular Chinese New Year traditions and superstitions may grant you some luck for the coming year (so it’s said). Chinese or not, you can’t go wrong greeting all and sundry with traditional Chinese New Year greetings. The most common greeting for the occasion is Kung Hei Fat Choi – (恭喜發財) – which means “happiness and prosperity”. You think Chinese New Year celebrations in local Chinatowns around the world are cool? The Chinese New Year festivities in Hong Kong are the great-grandaddy of them all. Thanks to streams of emigration from the city, much of what is seen in Chinese celebrations from San Francisco to Sydney originated in Hong Kong. So while different parts of China all celebrate in different ways and with different traditions, the Hong Kong celebrations are those that most visitors are familiar with - essentially fireworks, dragon dances and a parade of carnival floats. Present-day festivities cover Hong Kong-only activities like fireworks over Victoria Harbour and an international cast of characters dancing and singing their way through Tsim Sha Tsui. Celebrations in Hong Kong are spread over three days, but pre-New Year activities begin long before the first firework goes off. Flower markets sprout up all over Hong Kong on the week preceding the New Year holiday. Travelers looking for the biggest (and most complete) market should venture over to Victoria Park in Causeway Bay. Tourists nearer Kowloon should try Mongkok’s Fa Hui Park. Chinese New Year proper kicks off with a Night Parade on Chinese New Year Eve that winds through Tsim Sha Tsui and the Victoria Harbour waterfront. 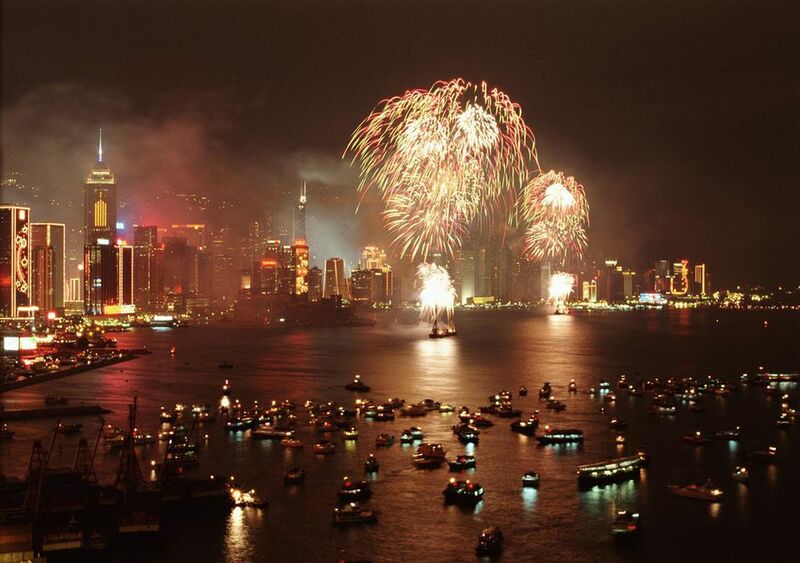 On the following night, a fireworks display illuminates Victoria Harbour, and is best seen from a boat on the harbor itself. On the third day, Hong Kongers like to test their luck with horse races on Sha Tin Racecourse, where the Hong Kong Jockey Club holds the year’s biggest equestrian party culminating in the Chinese New Year Cup. For a more complete explanation of these Hong Kong’s Chinese New Year festivities and a few others, read this article on Chinese New Year events in Hong Kong. Remember how business slows to a stop during Thanksgiving and Christmas in your neck of the woods? That happens in Hong Kong during Chinese New Year. The public sector closes early on New Year Eve, meaning truncated hours for banks, post offices and some forms of public transport. (The MTR will run all night on New Year Eve.) Schools and offices will be closed for anywhere between two to four days, beginning on New Year Eve. Expect business to come to a close by 6pm on New Year Eve. Restaurants will stay open, but will be packed with locals celebrating the holiday with their families. (Smaller, family-run establishments will be closed in any case.) The flower markets will be open till dawn, but again, will be too full of people to be completely enjoyable. Some sightseeing attractions like Disneyland and Ocean Park Hong Kong will stay open; others, like public museums, will close on the first day of the New Year, but will open afterward.